How to Convert QLV to MP4? If you did not install the Tencent Video Player, free download it. Search and find the wanted video in Tencent Video Player client. Play the video, you will find the download button in the upper right corner. Press the “Download” button to download the video. Click on “Setting” in the menu drop-list to open the “Setting Window”. Under the “Download Setting”, you will see “Cashe Management”. Copy the folder path and paste to my computer path to open it. You will see a folder named “vodcache”. 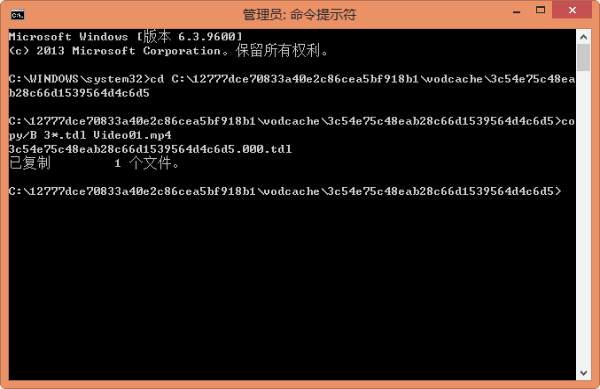 And under “vodcache”, there are many folders. Select the latest folder to open it. Copy the folder path. Press “Win” + “R” to run CMD as administer. Then enter (CD) (only CD, do not include brackets). Then right click the mouse to paste the path you just copied. Press enter. Then we come to the key step. Copy and paste the convert command (copy/B a*.tdl Video01.mp4) to CMD. Note that do not include the brackets, and change “a*.tdl” to the start character of your file name. My file name start from 3, so I copy and paste the convert command as (copy/B 3*.tdl Video01.mp4). Press enter to start convert. You will found a video name Video01.mp4 under the folder you just opened. How to Convert CAF to WAV, 24bit WAV, 5.1 Channels on Windows/Mac? How to Play Video Audio MP4,MKV,MTS,FLV,FLAC,MP3, etc. on iPhone Xs/Xs Max/Xr/8/8 Plus without conversion?